LondonJazz: CD REViEW: Arun Ghosh - but where are you REALLY from? 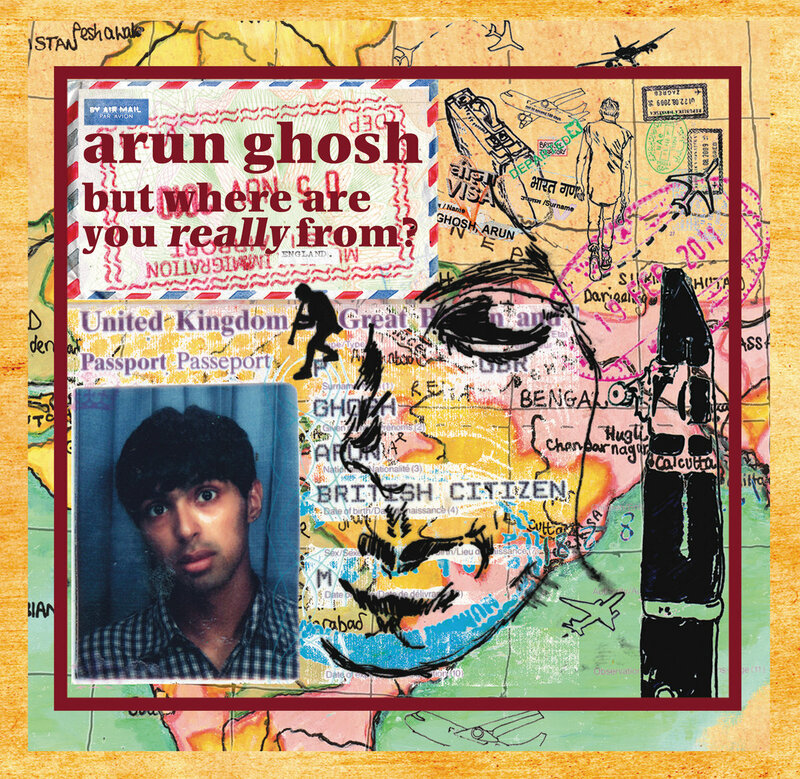 CD REViEW: Arun Ghosh - but where are you REALLY from? 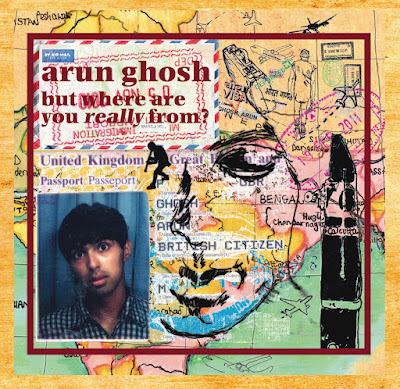 Arun Ghosh - but where are you REALLY from? "But where are you really from?" A question that raises more issues than a single answer can solve. In our increasingly jumbled society, many of us are from somewhere else, and from somewhere else before that. Arun Ghosh has answered what might have been an offensive question by producing work that reflects where he's from – geographically, culturally, and emotionally. He mixes south Asian rhythms, rock riffs, a vast array of instruments (he's credited with playing 11 himself), even an arrangement reminiscent of a colliery brass band, to create a hybrid that is clearly jazz. It contains some heavy tracks - Dagger Dance features a deep, rumbling bass line and a slow, rock beat that goes to some dark places. There are uplifting, sunlit tunes like Punjabi Girl and (baby baby) That's The Way I Am; there are deeply emotional pieces such as This Loneliness Is Killing Me, arranged for reeds only and featuring James Allsopp on bass clarinet, and the beautiful and achingly slow Love & Laugh & Love & Cry. Much of it made me want to dance. Consistent throughout is Ghosh's enticing clarinet playing. On Nataraja, one of only two tracks not written solely by Ghosh (he co-wrote it with Chrys Chijiutomi), his clarinet winds its way through a fusion of Indian and jazz music that pulls one along. On both Smash Through The Gates Of Thought and Voice Of Freedom he plays over fast rock – almost punk – backing, the musicians he's assembled proving adept at meeting the variety of styles Ghosh requires. Chris Williams and Lirin Donin, both from Led Bib, feature on alto sax and bass respectively; Idris Rahman, a long time collaborator with Ghosh, plays tenor sax on most tracks. Dave Walsh and Myke Wilson share the drum duties, Walsh seeming to play on the faster, rockier tracks. Percussionist Sarathy Korwar adds tabla and dholak to the more Asian influenced tunes. Several tunes reference England, with extra twists from Ghosh. Pastoral Sympathy (This Land Is Mine) is as bucolic as its title might suggest, but seen through an Asian lens. Made In England (For Parv) - the filmmaker Parv Bancil, who died this year – mixes bhangra, dub and jazz in a way that Ghosh reckons could only have been made in England. He closes the CD with a rendition of Parry's Jerusalem, accompanying his crystal clear clarinet with harmonium. The tune can be one of the most jingoistic, often used in place of an English national anthem. Here Ghosh makes it his own, an apt response to those who might ask "but where are you really from?" Arun Ghosh plays Rich Mix in London on November 11, as part of EFG London Jazz Festival, and is touring England until December.